To Brevard High School seniors, May 31, 2013, will forever be a special day as they walk across the stage with their classmates, receive their diplomas and embark on the next chapter in their lives. However, for 17-year-old Zack Fisher, May 31 is the culmination of a battle that began exactly one year ago and tested the resolve of himself along with his entire family. While most other seniors spent the past year finalizing plans for college, struggling to complete senior projects and enjoying their final days at BHS, Zack’s life was an endless series of hospital visits, blood tests and chemotherapy sessions as he fought against Ewing’s sarcoma, a very rare strain of bone cancer. Zack is the son of Frank Fisher and Sabrina Kensinger. Apart from his size – 6-feet-5-inches tall and weighing just over 300 pounds – Zack is a typical teenager who enjoys hanging out with friends, has a passion for working on cars and trucks and, by his own admission, is known to be a bit of a risk-taker. “I’ll do pretty much anything once, and if I don’t kill myself doing it, then I’ll probably do it again,” Zack said. “He’s pretty much been trouble since the day he was born,” Kensinger said of the couple’s only child. While Zack certainly lives his life to the fullest, all that changed on May 31, 2012, when Kensinger, going off what can only be considered as mother’s intuition, discovered a lump on the back of her son’s leg. With the family at home and settling down for the night, Kensinger said she was in her bed reading when a premonition led her to go check on her son. “My friends always tease me about being a witchy woman, but something just told me go and say goodnight to him,” Kensinger said. When she entered his room, Zack was laying face down on his bed resting. It was then that Kensinger noticed the lump on his leg, something Zack said he had noticed but simply thought nothing of. After going to Urgent Care the next day, physicians told them they weren’t sure what the growth was, but they were sure it needed to be removed surgically. Once the surgery had taken place, a local pathologist thought the growth might be a cancerous tumor and sent the results to Cleveland, Ohio, for confirmation testing. It was three weeks later when the family got the devastating diagnosis of Ewing’s sarcoma. For Zack’s parents, the news hit with the force of a sledgehammer. Zack’s father summed up his emotions in just one word: terrified. Ewing’s sarcoma is a rare disease, afflicting less than five out of every million teenagers between 15 and 19 years old. It has no known cause, though it is prone to strike males more than females. While his parents were understandably in shock, Zack said his main emotion was anger. “I was really just mad, most of all because it was finally my senior year,” he said. Once the diagnosis was confirmed, Zack began chemotherapy sessions shortly thereafter. The sessions were done in Asheville, under the care of a doctor who previously worked at St. Jude’s Children’s Hospital, a leading children’s cancer research center, for 17 years. Zack underwent chemotherapy for three weeks of each month. Two weeks were outpa-tient treatments, but one week required him to stay in the hospital. Throughout the ordeal, Zack maintained a matter-of-fact attitude and said the only thing on his mind was going through treatment and moving on. “I really just wanted to get it over with. Every time I went in for treatment I just couldn’t wait to leave,” he said. Kensinger said her son’s willpower was something most nurses said they rarely see among young cancer patients, but those who know him well said they wouldn’t have expected him to respond in any other way. Even with a defiant attitude, the chemotherapy took a toll on Zack and he would experience bouts of nausea and sickness following some of the treatments. For his parents, the process of watching their son go through such pain was the worst part of the ordeal. However, in typical fashion, Zack maintained his resolve, as if he simply made up his mind that defeat was never an option. “I remember there were a few times when I would fall apart and Zack would just hug me and say, ‘Mom, it’s going to be OK,’” Kensinger said. Despite the long hospital stays and exhausting rounds of chemo, Zack said he was mostly sad that he didn’t get to have the normal experiences of a high school senior. He completed the necessary coursework to graduate through homeschooling, though he jokingly admitted there was “a lot of procrastination” involved in the process. Zack recently completed his final round of chemotherapy earlier this month and test results indicate he is now 100 percent cancer-free. “We were actually on our way from the doctor’s in Asheville when the nurse called us and said, ‘(The tests) aren’t only clear, they’re crystal clear,’” Kensinger said. Ewing’s sarcoma is known to be an aggressive form of cancer and in many cases it returns even after a period of remission, so Zack will continue to be tested and scanned every three to six months to ensure it does not return. Zack said he feels fine physically and if it were not for the hair loss and a scar on his left chest from a port being inserted so doctors could administer the chemo drugs intravenously, there would be no indications he ever had cancer at all. 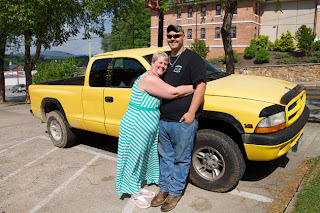 Zack plans to attend Blue Ridge Community College and eventually would like to go to the Nashville Auto-Diesel College to work toward becoming a mechanic. His family says the past year has been a roller coaster of emotions, one that has given them a new perspective on life. Kensinger said she wanted to use her family’s experience to help others and also bring awareness to the need for blood platelet donations, something that undoubtedly played a major role in saving her son’s life. “There’s a lot of local blood drives but to donate blood platelets you have to go to the Red Cross in Asheville and there’s a real shortage of supply,” she said. Fisher said his son’s graduation would be bittersweet for him as he’s watched him overcome so many obstacles in the past year and now move on to start life on his own. If life was a script, there could perhaps be no better ending to this chapter in Zack’s journey than coming full circle this Friday, from one year ago and facing the biggest challenge of his life to walking the stage, graduating high school and celebrating a victory greater than most will ever know. Never wavering, never complaining and never asking why, Zack said he’s ready to turn the page and return to a sense of normalcy, daredevil spirit and all. “Me and my friends, we say it all the time, ‘We’re idiots.’ We do crazy things and sometimes one of us ends up getting hurt. I’ll probably cut down on that just a bit, but other than that I plan on going on like everything is normal,” Zack said.